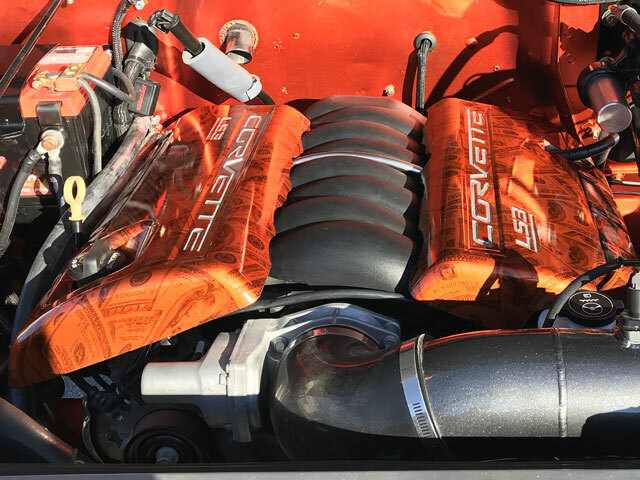 We dropped in a pristine new GM LS3 430 horsepower engine. We mated the engine with a brand new GM6L80 6 speed automatic transmission. This modern engine/transmission combination with its low rumble and high rev makes for one excellent driving machine. We then added the heavy duty Currie RockJock 60 rear axle for excellent ground clearance, custom fitted high accuracy Speedhut gauges, and a specially engineered Hydroboost brake system. All this made for a smooth and stealthy ride on or off road. On the second go round, the first thing was to strip the jeep to the bare frame. 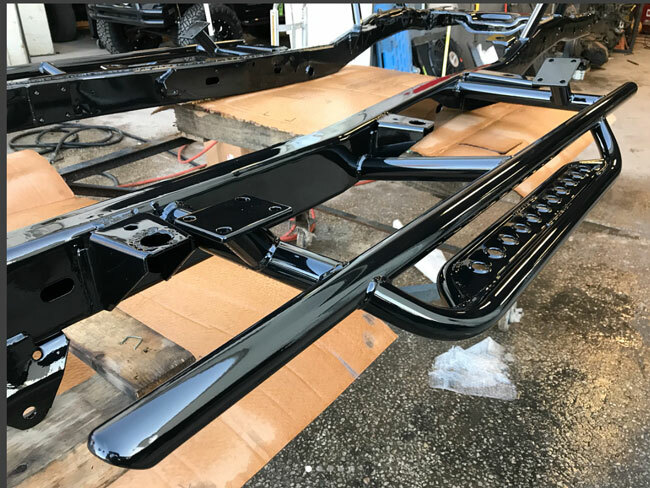 With cleaning, sanding, doing any framework repair, and fresh powder coat by Pro-Tech Powdercoating of Jacksonville, we brought the undercarriage back to its original glory. Next came spring over axle suspension using Rubicon Express 1.5 SOA leaf springs, Fox Reservoir Shocks with compression and rebound, custom traction bar, custom fitted Dana 44 front axle, industry leading Moser Engineering custom axle shafts, Wilwood brakes for stopping them in their tracks and high steering with an AGR powerful steering box. For getting in and out with style and ease we fitted a custom fab Rocker Protection Panel and Steps. 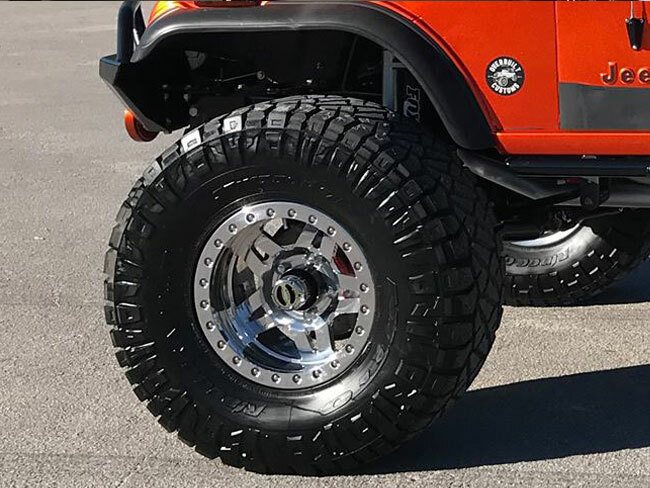 For durability, a great ride and awesome look the Nitto 37×13.50×17 Ridge Grapplers were mounted on brilliant made to order Fuel Forged 17×9 Beadlock Wheels. We did a total re-gear using the sturdy and reliable Revolution Gear & Axle products. The tough and durable bumpers are by Smittybilt. We added a Factory 55 winch thimble for the sleek look and strength to withhold the ruggedness needed for off-road adventure. 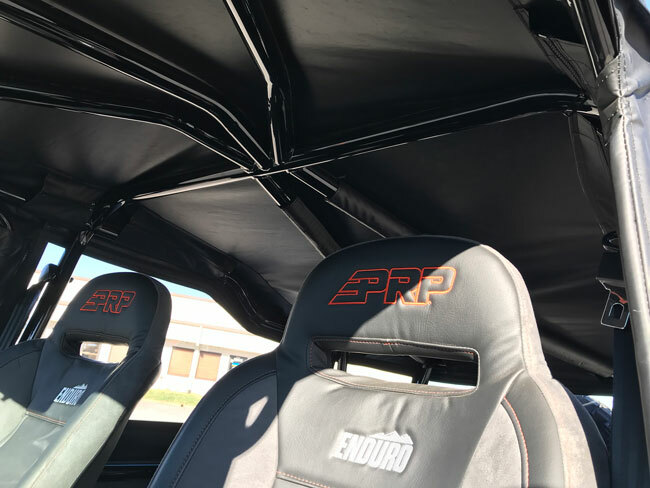 Rounding out the exterior Sean and the guys designed and fabricated a one of a kind rollcage and cargo basket of D.O.M. steel tubing. The result is a safety inspired, resilient and captivating vision with a black custom top hand crafted and installed by Topstich Custom Canvas in Fernadina Beach. 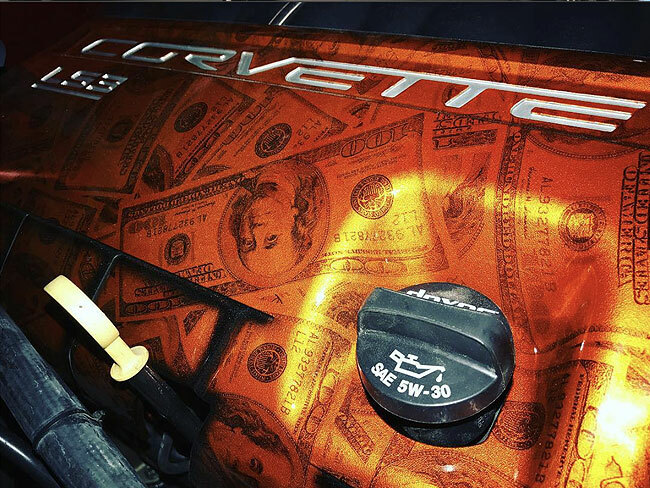 For an additional conversation piece under the hood, we took the Corvette engine cover to Liquid Carbon Designs of Jacksonville for some custom Hydrographics. 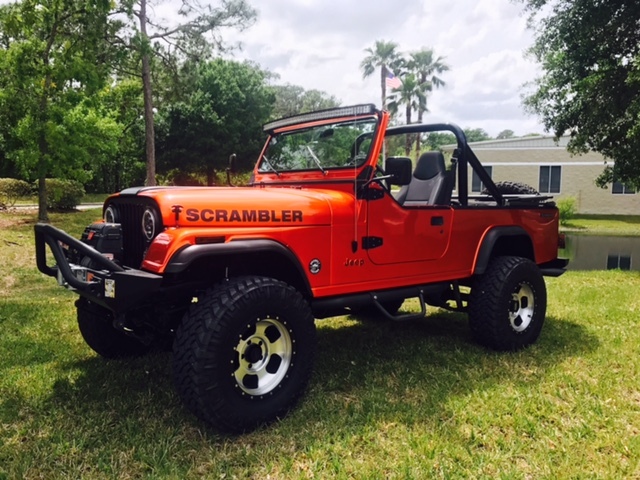 The idea of a “Show me the Benjamins” theme that matches the exterior brilliant orange color and the owner’s personality turned out perfectly. 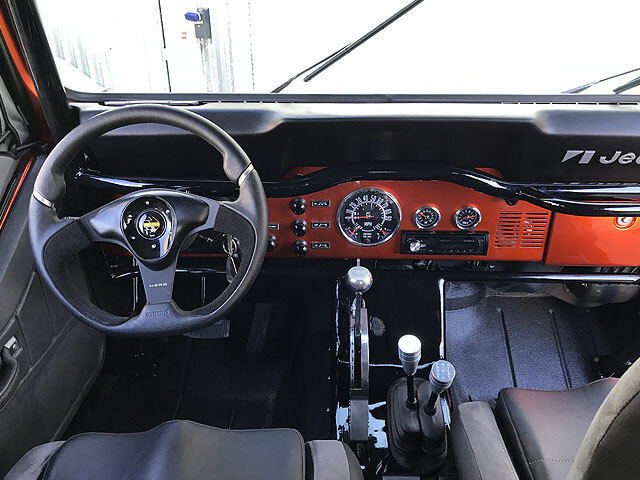 Interior touches include a silver legendary B & M Racing automatic gear shifter and PRP Seats custom designed and made especially for Jeeps, trail rigs and 4×4 vehicles. The top quality stereo and sound system uniquely personalized by Rollin’ Sound of the Avenues rocks out and lights up the night. Crown Automotive supplied authentic CJ parts.